Let's start at the beginning: What is the supply chain bullwhip? As Mr. Sheffi explains: "During an economic crisis, the exaggerated decline in orders can be especially damaging to upstream suppliers that have high fixed costs tied to production assets." In other words, when an ecocomic contraction hits, it can act like a bullwhip. For example, when the stock market crashes there might be a 10% reduction in retail sales, leading to a 20% reduction in inventory among wholesalers (anticipating lower sales going forward) and a 40% reduction in output by manufacturers (anticipating lower demand from the wholesalers going forward). According to Mr. Sheffi: "The trigger unleashing the current bullwhip was the implosion of the Shanghai Stock Exchange (SSE) Composite Index. It reached a peak on June 12  and then proceeded to lose over 40% of its value by the end of August  despite efforts by the Chinese government to prop up the market." The Chinese government's response to this crisis has been immediate support of the market - manifested as a spending spree ($235 billion to buy shares and bolster prices) - and restrictions on sales by insiders and short-selling, which have made many Western and Chinese investors leery. The Chinese authorities have even arrested Wang Xialou, a journalist who reported on the sell-off for the Chinese business magazine Caijing - sending chills through more than a few newsrooms. And, as Ms. Sheffi notes: "The SSE carnage led to widespread stock markets declines all over the world as investors, fearing the implications of a Chinese economic slowdown, started to flee equities, especially those of companies exposed to China’s appetite for commodities." But, Mr. Sheffi wonders, what if the fears of a bursting Chinese bubble are over-amplified by the bullwhip effect? Many companies around the world are in the process of pulling back. The supply chain is starting to contract - as in a typical bullwhip. 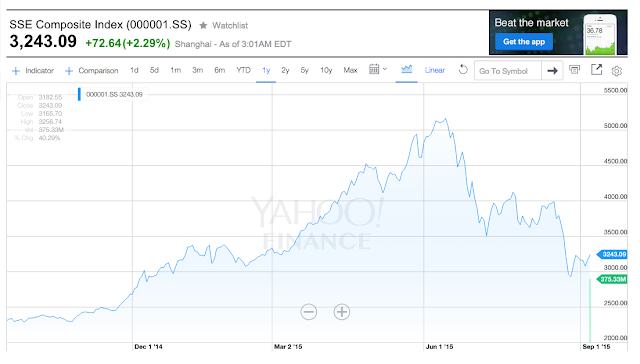 Is China really in a freefall - or was the big drop in Shanghai merely a (big, nasty) correction? Have we seen the end of China's remarkable growth? Or will the shift to a consumer economy in China continue? How are companies with interests in the Chinese market supposed to respond to this summer's stock market volatility - without overreacting and losing opportunities if (when?) the demand from China continues? As Mr. Sheffi notes: "Lessons from the 2008 financial crisis can help companies adjust to both the down swings in demand as well as the upswings that are sure to follow. Macroeconomic data during the 2008 financial crisis show the bullwhip effect operating... For example, U.S. retail sales (representing consumer demand) declined by 12%; yet U.S. manufacturers pulled down inventories by 15% and manufacturing sales declined almost 30%, while imports plunged over 30%." How should upstream suppliers and others respond to the current Chinese-inspired crack of the bullwhip? Mr. Sheffi advises: "Conserving cash is extremely important - both in order to survive the downturn and in order to be able to respond quickly when the demand returns... Layoffs should be kept to a minimum, using the time for training and upgrading capabilities in order to anticipate the second, up-stage of the bullwhip [and]... Downtimes, when there is significantly less resistance to change and underutilized workers are available to make on them, provide excellent opportunities for companies to tackle challenging restructuring projects." The conclusion, for those looking for opportunity in the volatility? "As the China crisis continues and the bullwhip cracks, leaders should... focus on strengthening their operations."